The plaque is on the first pew from the west end on the north side of the chancel aisle. There are two references to Old Etonians who died during the Crimean War in the church, but the only record of who they were is in the 1873 Guide to the Church. How the author came by these names is unknown - they differ wildly in level of detail and do not necessarily correspond with other available records. Recorded below are the entries from the 1873 Guide in dark blue and our additions in a grey font. Much of the additional information is sourced from the Officers Died site. JAMES HUNTER BLAIR was M.P. for Ayrshire and Lt-Col. Scots Fusiliers Guards; killed at the battle of Inkerman, November 5th 1854. The eldest son of Sir David Blair, of Blairquhan. Aged 38. Buried on Cathcart's Hill. LIEUT. LEWIS KEKEWICH, 20th Regiment, was at the battles of Alma, Balaklava and Inkerman, slightly wounded in the last battle; died at Corfu, February 16th 1855, aged 18. FREDERICK HENRY RAMSDEN, Captain Coldstream Guards, killed at the battle of Inkerman. Memorial, Royal Military Chapel, Wellington Barracks, London - "In memory of Frederick Henry Ramsden, Lieutenant and Captain, Coldstream Guards. Born June 9 1830. Having served for 4 years in the Rifle Brigade, he joined the regiment in September, 1851; landed with his battalion in the Crimea, and was present at the battles of the Alma, Balaklava, and Inkerman, at which last he fell, November 5 1854, aged 24 years. Placed by his Family." LEONARD NEILL MALCOLM, 2nd Lieutenant Rifle Brigade, killed in the Crimea. Memorial, First Brigade, Light Division cemetery - "Sacred to the memory of Lieut. L. Neil Malcolm. 2nd Battn Rifle Brigade who was killed at the battle of Inkmerman on the 5 Novr 1854 aged 19 years." JAMES CHARLES MURRAY COWELL, Lt Col. Coldstream Guards, killed at Inkerman. Memorial, Royal Military Chapel, Wellington Barracks, London - "James Charles Murray Cowell. Eldest son of the late Sir John Stepney Cowell Stepney, Bart. MP, of Llanelly, by his second wife, Euphemia, daughter of General Murray, of Glenalla. Some years Page of Honour to King William IV, and Queen Victoria; afterwards Captain and Lieutenant-Colonel Coldstream Guards. He fell at the battle of Inkerman, November 5th 1854, aged 30. He lies buried on Cathcart's Hill, near Sebastopol, with seven of his brother officers, Brothers in Arms, in Glory, and in the Grave. 'And the victory that day was turned into mourning.' Given by his uncle, General Freeman Murray." THE HON. GREY NEVILLE, 5th Dragoon Guards, died of wounds received in the cavalry charge at Balaklava. Buried at Scutari - "Sacred to the memory of Honble Grey Neville 5th Dragoon Guards. Youngest son of Lord Braybrooke. Died at Scutari Novr 1854 of wounds received at Balaklava 25th Octr 1854 Aged 24 years. Surviving by only six days his brother the Honble Henry Neville, Grenadier Guards, Killed at Inkerman 5th Novr 1854. To the dear memory of those so loved and early lost their sorrowing Family inscribe this stone." HENRY LANGHORNE THOMPSON C.B., one of the gallant defenders of Kars, formerly 68th N. Infantry, died a few days after his return home in 1856. HORACE WILLIAM CUST, Captain Coldstream Guards, A.D.C. to General Bentinck, killed at the battle of the Alma. Memorial in the Royal Military Chapel, Wellington Barracks - "In memory of Captain Horace William Cust, Coldstream Guards. He joined the Regiment on the 7th April 1848, and embarked with the 1st battalion for the Eastern Campaign, February, 1854. He served as Aide-de-Camp to Major-General Bentnick, Commanding the Brigade of Guards at the Battle of Alma, 20th September 1854, where he was mortally wounded by a cannon shot. His Grave is on the bank of the Alma. Placed by his brother, Lieut-Col. J. Francis Cust, late Grenadier Guards." WILLIAM WHITAKER MAITLAND, died of disease contracted on the Crimea.Captain William Whitaker Maitland - 49th Foot - died of disease contracted in the Crimea - 15 Nov. 1856 Aged 31. Son of William Maitland, Loughton Hall, Essex. ASHTON SAMUEL YATE BENYON, Lieut. 53rd Regiment, died from exposure in the Crimea, 1855. ROBERT HENRY PAYNE CRAWFURD, Captain in the 96th Light Infantry, died in the Crimea.Captain Robert H. Payne Crawford - 90th Light Infantry - died of disease at Scutari - 24 Feb. 1855 Son of Robert Crawford, of East Grinstead, Sussex. "R.H. Payne Crawford Captain HBM XC Reg died at Scutari Feb 24 1855." Memorial at St. Swithuns Church, East Grinstead, Sussex - "Robert Henry Crawford Capt in HM 90th Light Infantry eldest son of Robert Crawford of Saint Hill. Died February 24th 1855 at Scutari of fever brought on by hardship and exposure during the disasterous winter campaign before Sebastopol aged 30 years." HERBERT WILLIAM WILBERFORCE, Lieutenant R.N. eldest son of the Bishop of Winchester, died at Torquay, 1856, on his return from the Baltic. CHARLES FRANCIS SEYMOUR, Lieut-Col. Scots Fusilier Guards, served in the Kafir War, and fell at Inkerman.4th Division (Scots Fusilier Guards) - killed at Inkermann - 5th November 1854. (Scots Fusilier Guards). Aged 35. Eldest son of Sir Horace Seymour, MP and grandson of Vice-Admiral Lord Hugh Seymour. Buried on Cathcart's Hill - "To Lieut. Col. C.F. Seymour Sco Fusr Guards killed in action Novr 5th 1854. Beneath this stone lie the remains of Lieut. Col. Charles Francis Seymour of the Scots Fusilier Guards Assistant Adjutant General of the Fourth Division who fell at the Battle of Inkermann Nov 5th 1854 by the side of his General The Hone. Sir George Cathcart on whose staff he had long served. Aged 35 years." Royal Military Chapel, Wellington Barracks, London - "To the memory of Lieut-Colonel Charles Francis Seymour, of the Scots Fusilier Guards, Eldest son of Sir Horace Beachamp Seymour, MP, and grandson of Vice-Admiral Lord Hugh Seymour, who, while serving as Assistant Adjutant-General of the 4th Division, was killed by the side of his General, at the battle of Inkerman, in the Crimea, on the 5th November 1854, aged 35 years. In a despatch dated before Sebastopol, November 11th 1854, Field-Marshall Lord Raglan thus reported his death - "And I may here express my deep regret that Lieut-Colonel Charles Francis Seymour, Scots Fusilier Guards, should have fallen. He had served on the Staff with the late lamented Sir George Cathcart, at the Cape, and had accompanied him to this country in the capacity of Assistant Adjutant General; and he was remarkable for his intelligence, gallantry and zeal." This tablet is erected by his brother and sister." CHARLES AUGUSTUS PENRHYN BOILEAU, Lieutenant Rifle Brigade, died at Malta 1855, of wounds received before Sebastopol. This Officer is also recorded as an Old Rugbeian where it is noted that his gallantry had been especially commended by Lord Raglan. His date of death is recorded as August 1st. ARTHUR FERDINAND PLATT, Major 49th Regiment, died at Scutari, 1855 11 August 1855 Aged 20. Son of Samuel Platt, of Belmont, Wimbledon. .
EDWARD ROWLAND FORMAN, Captain Rifle Brigade, was killed in an assault on the Redan in 1855. Memorial, First Brigade, Light Division cemetery - "Sacred to the memory of Capt. E. F.(sic) Forman. 2nd Battn Rifle Brigade who was killed at the assault on the Redan on the 18th June 1855 aged 33 years, this stone is erected by his brother officers." LACY WALTER YEA, Lieut. Colonel 7th Royal Fusiliers, was killed at the storming of the Redan, 1855. 18th June 1855. First Brigade, Light Division cemetery - "7th Royal Fusiliers. To their Colonel Walter Lacy Yea who was killed on the 18th June 1855 whilst gallantly leading the storming party against the great Redan. Aged 47 years." EDWARD JOHN WELLESLEY, Major 73rd Regiment, Assistant-Quartermaster-General, died of cholera after the battle of Inkerman. The 'Officers Died' site has the date of death as 21st September 1854. JAMES MOLESWORTH, 7th Royal Fusiliers, died at Malta on his return from the Crimea. HENRY ASTLEY SPARKE, Lieutenant 4th Dragoons, killed in the Balaklava charge, 1854. JOHN BARRY MARSHALL, Captain, 4th Light Dragoons, died of fever in the Crimea. 4th Light Dragoons - died of disease at St. George Monastery, Balaklava - 20 Sept. 1855. Aged 25. Son of William Skinner Marshall, of London and of Stowmarket, Suffolk. Memorial at Wetherden parish Church, Suffolk - "Sacred to the memory of John Barry Marshall Esqre Captain 4th Light Dragoons who died on the 20th of September 1855 of Crimean Fever at the Monastery of St. George, Balaklava Heights aged 25 second son of William Skinner Marshall Esqre No. 4 Hyde Park Square, London." GEORGE HENRY PROCTOR, Balliol College, Oxford, Assistant Chaplain in the Crimea, died of fever at Scutari, 1855. GEORGE DUCKWORTH, Captain, 5th Dragoon Guards, died in Varna Bay, on board the'Bombay' in 1854. JOHN ARTHUR FREEMAN, Captain, Scots Greys, died at Balaklava, 1854. CORNELIUS GICHAN SUTTON, Captain, 23rd Fusiliers, died the night the troops landed in the Crimea, September 18th 1854. AUGUSTUS COX, Lieutenant-Colonel Grenadier Guards, died at the Alma on the arrival of the Army there, September 21st 1854. The Redcoat site has the date of death as 26th September 1854. AUDLEY LEMPRIERE, Captain 77th Regiment, killed before Sebastopol. Second Brigade, Light Division cemetery - "In memory of Audley Lempriere, Eldest son of Rear Admiral Lempriere of Pelham, Hampshire in England and Captain in the 77th Regiment who fell before Sebastopol while attacking the Russian Rifle Pits on the 19th April 1855. Aged 20 years." JAMES BIRDSHARPE, Major. The Redcoat site record has Major J.B. Sharpe - died of wounds at Scutari - 28th December 1854. Buried at Scutari - "Sacred to the memory of Major J.B. Sharpe 20th Regiment who died at Scutari 28th Decr 1854 of wounds received at the battle of Inkerman." HENRY MONTOLIEU BOUVERIE, Captain Coldstream Guards, killed at Inkerman. Only son of Lieut-General Sir H. Bouverie. Memorial, Royal Military Chapel, Wellington Barracks, London - "In memory of Lieutenant and Captain Henry Montolieu Bouverie, Coldstream Guards. Killed at Inkerman, 5th November 1854. Only son of Lieut-General Sir H. Bouverie, also of the Coldstream. Placed by a comrade, the last surviving in the regiment, 1880. Arthur Lyon Fremantle, Colonel and Lieut.-Colonel." Memorial at St. James Church, Alveston, Warwickshire - "To the memory of Captain Henry Townsend, HM 14th Regiment who died of cholera on the 29th November 1855 at Therapia whilst returning to resume his duties in the Crimea aged 28 years. Erected by his brother officers who much lament his loss." FRANCIS BYAM DAVIS, Lieutenant Grenadier Guards, died at sea of wounds received before Sebastopol. Son of General Francis John Davies (67th Foot) and Elizabeth Davies. Memorial in the Royal Military Chapel, Wellington Barracks, London - "Lieutenant F.B. Davies, born June 3, 1835. was present with the Grenadier Guards at the Alma. He died from the effects of a wound recieved in the trenches before Sevastopol on the 10th of November 1854. Placed by the Lady Hampton and Colonel H.F. Davies, Grenadier Guards." HERBERT MILLINGDAMP VAUGHAN, 95th Regiment, wounde and taken prisoner in attack on Redan, died in hospital. Aged 26. Son of Lt-Col. Vaughan (90th Foot), of Langoedmore, Cardiganshire. HON. FRANCIS GROSVENOR HOOD, Lieut-Colonel Coldstream Guards, killed in the trenches before Sebastopol. Memorial, Royal Military Chapel, Wellington Barracks, London - "Colonel the Hon. Francis Grosvenor Hood, who commanded the 3rd Battalion Grenadier Guards at the Battle of the Alma, and who was killed in the Trenches before Sebastopol, on the 18th October 1854." JOHN HENRY UPTON SPALDING, Midshipman, was killed in the trenches before Sebastopol. OWEN GWYN SCAWDEN DAVIES, Lieutenant 38th Regiment, killed in the Crimea, 1855. DUNCOMBE FREDERICK BALL(sic) BUCKLEY, Captain Scots Fusilier Guards, killed in the trenches before Sebastopol, 1855. Buried on Cathcart's Hill - "Sacred to the memory of Duncombe Frederick Batt(sic) Buckley Lieut. and Captain Scots Fusilier Guards Who was Killed in the Trenches before Sebastopol 6th Sept. 1855." HENRY THOROLD, Ensign 33rd Regiment, was shot through the heart while serving out cartridges at Inkerman.5th November 1854. Correspondence from David Broomfield has thrown further light onto the compilation of names offered by Archdeacon Wright in the guide to the church. 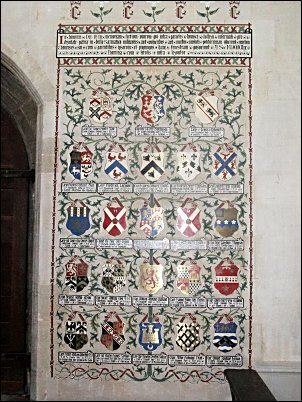 David kindly sent some images from the Ante Chapel at Eton College which contains another memorial to the Old Etonians killed in the Crimean War. On these two plaques there are a total of 47 names, whereas Wright has only listed 44. The additional names are Capt Francis Evans, Capt Edward Crofton and Lt Henry Neville (who is mentioned under the listing for his brother Grey Neville, above, but who does not have an independent entry). 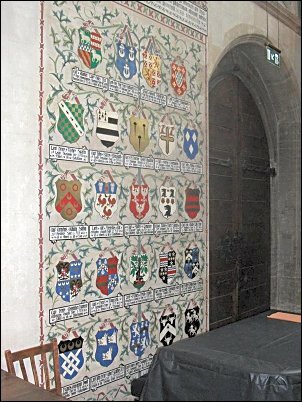 The plaques contain the arms of the families to which each man belonged and as David says "Heraldically speaking I think this is some of the finest heraldry you will see anywhere. Not that there aren't mistakes, the arms of the Neville brothers are given to the wrong brothers and Maitland has been given the royal arms of Scotland!" A sad postscript to this information is the fact that if your family were not armigerous (ie entitled to bear arms), then your name would not have been memorialised on these plaques. If there were any such men, their names have not yet come to light.